Driving a truck is hard work, particularly on the human body. The common bond between coping with inconsistent schedules, noisy lots and everything that goes with living in a truck is sleep. Not just any sleep, but good, plentiful, restful sleep. Getting enough high-quality sleep can be the difference between the split second of reaction time needed to avoid a crash or fighting off the variety of colds and other bugs just waiting to invade a compromised immune system. The unpredictability of load schedules can translate into equally strange sleeping schedules. 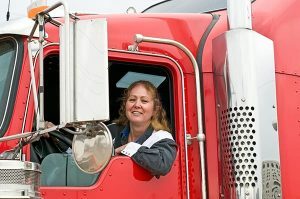 Drivers who create a bedtime routine to counteract the challenges of this lifestyle experience better health and generally safer driving records. Many drivers are at higher risk for sleep-related issues simply because they do not realize they have a sleep disorder. Sleep apnea and insomnia are more common than most people realize. This can be easier said than done in a truck, but the payoff of enjoying a good rest is worth the extra effort. Block out as much noise as possible, using earplugs or a white noise machine (something as simple as a fan will do) to minimize distractions. Keep your cab or bunk area cool. Darken your sleep environment with shades, curtains, or even wear an eye mask. Park in a level spot. Invest in a comfortable pillow. Preparing your body and mind for sleep is step one to falling asleep quickly and avoiding the frustration that comes with tossing and turning. Tell your family, friends and dispatcher when you plan to sleep so they will know not to disturb you. Tell your brain it’s time to gear down by taking care of activities of daily living such as brushing your teeth, washing your face and changing clothes. Any exercise you can squeeze in that does not impact sleep time will improve your ability to fall asleep. Consider using a guided meditation audio to guide you through the process of turning off your brain. For more information about effective sleep hygiene, please call Beth Keller, business liaison, at 573-331-3959.